Editors Note: There is a photo and 2 videos associated with this press release. The wait is over. Today is the day. 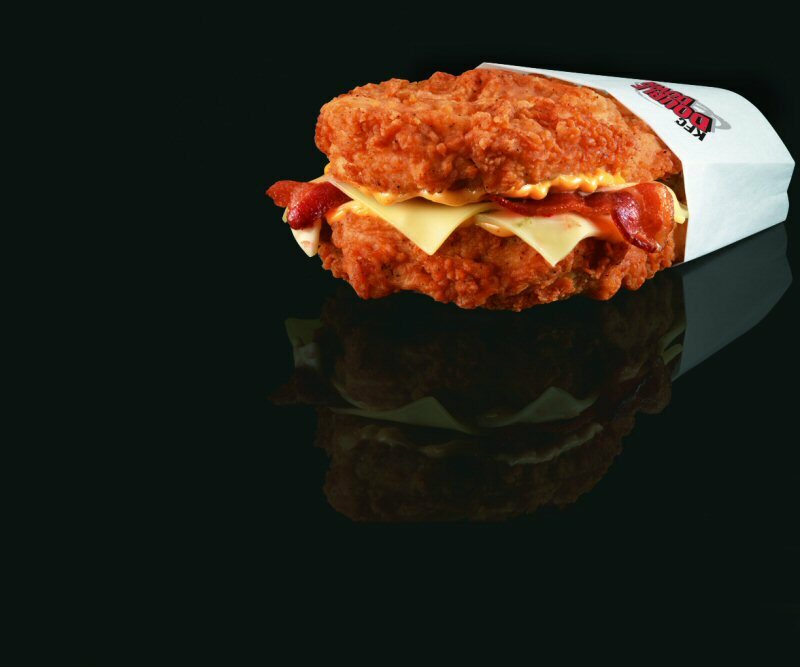 Double Down – KFC Canada's epic, bun-less sandwich lands in 729 KFC restaurants from coast-to-coast today. The legendary, big eat caused worldwide buzz when it debuted in the USA — and it's the most successful sandwich in KFC history. More than 10 million Double Downs were sold south of the border in less than a month! "We have been amazed by Canada's reaction to Double Down. There's a lot of excitement and people tell us they are planning Double Down parties with their friends," confirms Dan Howe, Chief Marketing Officer, Yum! Restaurants Canada. "We knew Canadians would love Double Down because they've been begging us to bring it to Canada; but we've been blown away by the interest since we announced Double Down's arrival in Canada." "Double Down has so much 100 per cent, premium seasoned chicken, we didn't have room for a bun," says Howe. He says 64% of Canadians were in favour of bringing Double Down to Canada and close to half – 47% "think they have what it takes to Take Down the Double Down." For the legions of Canadians who Take Down the Double Down, there's a Wall of Fame where Double Down fans can claim bragging rights and post their photos for all the world to see. "Double Down is finally here," declares Howe. "Tell us what you think Canada by joining the KFC Facebook page and getting in on the eating event of the year. But don't delay. The most outrageous sandwich experience in the country will only be around until November 14th." Double Down is definitely a big, indulgent, occasional eat, but contrary to myth and speculation, Double Down has less, fat and calories than a deluxe burger with fries; a large restaurant sandwich; or a big steak dinner with all the fixings. "Double Down is delicious, but we know it's not for everyone," says Howe. "It's an occasional indulgence that Canada has a hunger for, which is why we're introducing it for a limited time, until November 14th. KFC represents more than 700 quick-service restaurants across Canada. KFC specializes in Colonel Harland Sanders' Original Recipe Chicken — the world's most popular chicken — home-style sides, freshly made chicken sandwiches, including the Double Down. In early 2007, KFC converted to a trans fat free cooking oil in Canada and many menu items now have zero grams of trans fat.